What is henna? Is this safe? Henna refers to a paste made from the dried leaves of the henna plant, Lawsonia inermis (distantly related to the pomegranate!). This paste can be applied to the body to make intricate designs. 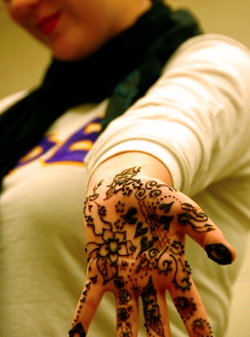 Henna can also be used to dye clothing, leather, hair, and nails. Henna applied to the unbroken skin of a healthy adult is 100% safe, and in fact henna has many therapeutic and medicinal properties. If you are allergic to Cajeput, Lavender, or Tea Tree Oil, or monoterpene alcohols, please speak to your henna artist. If you are pregnant, please speak to your henna artist. If you have a naphthoquinone sensitivity or G6PD deficiency, then you should avoid getting henna. The henna plant grows in hot climates all over the world, from Morocco to India. Some scholars hypothesize that the use of henna began in Egypt, and spread from there across the globe; other researchers point to the Arabian peninsula as the origin of henna use. It is impossible to determine the ultimate place and date of its exact origin. Today, the main areas of henna production are Pakistan and Western India, North Africa (especially Morocco and Libya) and the Middle East (especially Yemen). The leaves are collected, dried, and powdered, and then shipped all around the world. I saw this thing called ‘black henna’ - what’s that? "Black henna" is a misconception; true natural henna only ever leaves a reddish-brown stain. While there are related arts that use blue or blue-black pigments (for example, indigo, woad, or khidab), black henna does not exist. What is commonly marketed as 'black henna' is a dye (which may or may not have some henna) that usually contains a dangerous chemical called para-Phenylenediamine (PPD). PPD is very harmful for the body and should never be applied directly. It can cause blisters, open sores, and even permanent scarring. If you’ve gotten a 'black henna' tattoo, please tell your doctor. Recently, stalls have been popping up offering "PPD-free black henna". While it may be PPD-free, it’s still not pure henna - these products usually contain charcoal or arrowroot, and all sorts of additives and colourings (sometimes shoe polish!). Sometimes 'black henna' is done with body paints or airbrushing. The point is, whether it’s paint, chemicals, or something else, it’s not henna. My henna is guaranteed safe, natural, BAQ (body art quality) henna, with no PPD. See http://www.hennatribe.com/ppd.php for more info. How did you learn how to apply henna? I taught myself. I downloaded patterns from the internet, I practiced with pen and paper, doodled on myself, doodled on my notes, doodled on my friends, bought henna, practiced, practiced, and practiced. I read as much as I can find on anything related to henna. I’ve always been interested in henna, and I love doing it. It’s really not difficult, and it’s very rewarding. Don’t you have to be Indian/Sephardi/Muslim? Is this against my religion? Nope! That’s one of the great things about henna - anyone can use it. While henna does have ritual significance in many cultures, it’s not “sacred” to one specific culture or religion and it’s accessible to anyone who approaches it honestly and respectfully. There is an enormous diversity of henna traditions: religiously, ethnically, culturally... and you can always create a new tradition! Don’t ever let someone tell you that you can’t have/do henna because you’re not ____ enough. Khadija Dawn Carryl, of HennaSooq, at top, working with Noam Sienna, of Henna by Sienna, at bottom. Will you henna my child/grandchild/youngest sibling? Is there an age restriction? Children under the age of four shouldn’t get henna - their skin is very thin and delicate, and they often can’t sit still for long enough. Henna can be applied in small amounts to children between the ages of four and seven (if they are very good at sitting still and letting it dry). If you let us know ahead of time, we can bring glitter paints and other temporary art materials for younger children. Henna applied to the unbroken skin of a person over the age of seven is perfectly safe. Why won’t you henna this Chinese character? As a henna artist I am responsible for the design that I’m putting on your skin, which is going to last for at least a week; it would be irresponsible of me to have a client walk off with ‘Electric Dishwasher, Very Cheap’ on their arm. Since I can’t read Chinese (yet), I won’t henna it. I can read and write several other languages that I would be happy to henna on you. I draw all of my patterns freehand and am happy to draw something custom for you; many of my designs are abstract, while others have specific symbolic meanings that I am happy to explain to you. I don’t like any of your patterns. What do I do? Don't panic! You don’t have to choose from them! Nobody will force you to get something you don’t like. If you want a custom design, feel free to draw it out and show it to me. I’m also happy to sit down with you and plan out something special and unique for you or your happy occasion.